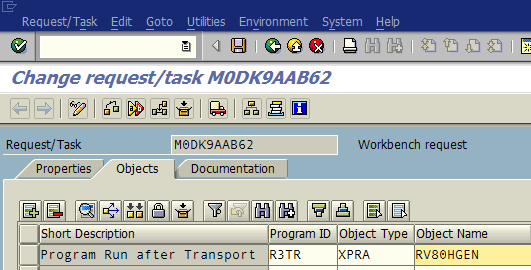 If you want to execute an ABAP program automatically after your transport is imported into the target system for example to a test system or quality system, ABAP developer can change the SAP transport request properties and add a new step in Objects tab using R3TR and XPRA (Program Run after Transport) to execute ABAP program for example RV80HGEN. If an ABAP developer has done improvements on a function group especially, when these changes are transported to other systems like test, quality or productive systems sometimes the developers should manually activate the changes on those systems. Instead of such manual tasks to be done after a SAP transport import, the SAP request can be configured to execute ABAP program to run automatically and activate the function group for changes. Open transport organizer using SE09 transaction. Select the SAP request you want to add automatic program execution step. Switch to change mode from display mode. In Objects tab insert a new row. Use R3TR in Program ID column and XPRA in Object Type column. Type the name of the ABAP program to run automatically after import in Object Name column. Save and exit transport request properties screen. After you add a new line in Objects tab on the SAP transport properties screen using R3TR as the Program ID and XPRA as the Object Type, you can provide the name of the ABAP report or ABAP program you want to run automatically after transport is imported on target systems.